Question: How long will the Gas Can™ by Campfire-In-A-Can ® burn on a 20 lb propane bottle/tank? Answer: Burn time is based on how large of a flame you have going. As the Gas Can™ by Campfire-In-A-Can ® can produce higher flames than most other propane firepits, you may go through gas faster when using it on its highest flame setting. In most cases, users get 10 - 13 hours on a tank! Question: Can I roast wieners and marshmallows with the Gas Can™ by Campfire-In-A-Can ®? Answer: Absolutely! The Gas Can is not rated as a cooking device, but people cook over them all the time. Not only will you get an evenly roasted wiener or marshmallow, you don't have to worry about getting ashes on your perfect snack! Question: How long is the hose? Answer: The hose is 10 feet long, allowing you to place the propane tank far away from fire itself so it doesn't interfere with your enjoyment of the Campfire-In-A-Can ®. The gas adjustment valve is located next to the regulator to safer flame level adjustments. Answer: The Campfire-In-A-Can ® weighs just under 15 pounds. The shipping weight is 22lbs. The Campfire-In-A-Can ® is ergonomically designed so that when it is carried your carry arm is close to your body, which prevents you from being thrown off balance. Question: What is the stuff on the bottom? Answer: The ceramic super glow bark chips are designed to provide you with a more realistic looking fire, without the mess of vermiculite. Question: Will the logs burn? Answer: No, the logs are much the same as the logs in a gas fireplace - they will not burn. Question: Does the Campfire-In-A-Can ® come with a propane bottle? Answer: Sorry, everything but the propane tank! We recommend a 20 lb propane tank, as you would use on a standard propane barbeque - they can be purchased at all home supply stores and they are inexpensive. 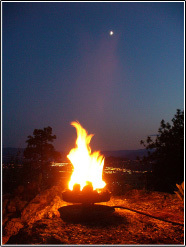 Question: How big is the Campfire-In-A-Can ® portable propane campfire? Answer: It is compact, light weight, and portable. It is 14.75" x 10.25" so you can have a campfire anywhere you want easily. It’s easy to carry at only 14.6 lbs. Question: Does it give off any heat? Answer: Yes it does. It is rated at up to 64,000 BTU's. A campfire just isn't a campfire without its pleasing warmth and glow! Question: Can I put real wood on it?